Labor (your life force energy) and free access to life unconditionally are not interrelated in any way. Very important to address this correctly and to let this sink in in the deepest level of your awareness. Via the workshop ‘vier het Vrije Leven, Jij en het Leven als Bronkracht‘ (text in English: Abundance IS) I’m pulling you through your inner duality triangle. That’s needed because otherwise you will (unconscious) drag the old into the new. And all collective problems are from the old. This you will understand after you’ve passed through the workshop. Its absolutely not needed to attend the workshop since ALL awareness from 'free unburdened and unburdening living together on Earth' is freely available (see the text below this article). Free life entrance unconditionally is our birthright. This is an inner awareness which you recognize in yourself as truth (about Life, so you understand this isn’t an idea or something of your mind). The moment you recognize this awareness, you will start to claim your birthright. And you start communicating from this awareness to yourself, your (direct) surroundings, and you will develop discernment in what truely comes into being from a free and untaxed living together and what not. The One Programming Rule is a compensation! of the reality that free life entrance is occupied (as a result of laws and rules, our current taxed paymentsystem in debt and so on). The monthly amount is a compensation, a restoration because of this fact and has nothing to do with labor/work in any way possible. The monthly amount (euro 750,00 - 1000,00) is a compensation because free access to life is stolen from you. So it’s your birthright to receive this monthly amount unconditionally and you don’t have to DO (no labor/work) nothing in return. This is very important to comprehend. Of course you can (and probably will) contribute your talents (your life force energy) to our living together. But not on demand, but from free will in any way you like/wish. That’s big difference. The moment you comprehend this awareness on your deepest core you automatically start sharing life entrance and start keeping life entrance in a shared state. From this awareness you will be able to govern yourself. No longer you accept governments to power over you, to rule and lead you. You are perfectly capable to lead yourself. From this moment on you will comprehend that representatives are there because to facilitate your choices: so you start to plead for your birthright which is a free untaxed living togetherness: you start to plead for The One Programming rule (which is the monthly amount you need to be alive physicly). From this moment on you will Embed the Transition, because you will understand there’s no waiting (for politics, governments etc.). You start to share life entrance yourself. And the way you do this, you do it. As soon as The One Programming rule, today we call it Existence Money, is implemented everyone in the Netherlands receives free access to life unconditionally. From that moment on a totally new situation and life-experience is created on Earth by which embedding of the Transition is done. Of course we can implement The One Programming rule, Existence Money, globaly so that every living Human Being on Earth receives free entrance to Life unconditionally (read also meest gestelde vragen, die gesteld worden aan de Levenscirkel). From oneness consciousness we KNOW that physical poverty doesn't exist, because there's no duality from oneness: we can restore physical poverty within one day with The One Programming rule. All dual problems will dissolve from a shared living togetherness. What a relief and relaxation you will feel bodily and energeticly when you dare to let sink in deeply the awareness from living together from a shared togetherness. Enjoy this! What this picture says is that you are the economical value of money. 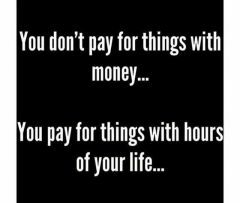 Your life force energy is the counter value of money. Not gold, silver, or whatsoever. And your economical value can be created out of nothing. Costs nothing. Money is transformed for years already (but the transformed money is refused by our govts: they still refuse to do their jobs and facilitate us in our living together on Earth.